Los Angeles spent $1.4 million to provide security, traffic control and other services for Michael Jackson’s memorial service, city officials said Wednesday as they looked for ways to have others help the financially troubled city pick up the bill. The amount included $1.1 million in overtime pay for the 4,173 officers who worked to secure Staples Center, Forest Lawn cemetery and other areas that attracted fans and members of the media, the Police Department said in a statement. City officials said the remaining amount covered traffic control, cleanup and other costs related to Tuesday’s public memorial service, which was attended by a total of more than 17,000 fans and watched by tens of millions of people around the world. Matt Szabo, a spokesman for Mayor Antonio Villaraigosa, hailed the tally a success. He said it was “far less” than the initial estimate of $4 million. Trutanich aims to have a report ready for the City Council by Friday, said spokesman John Franklin. 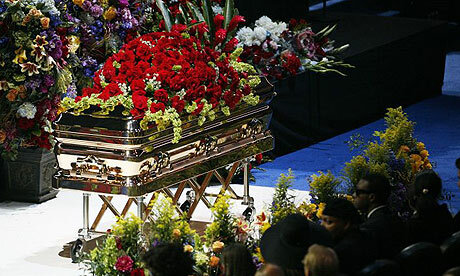 One of the most expensive Casket been brought to michael Jackson's funural. The city has also set up a Web site urging fans to make tax-deductible donations through credit cards, PayPal or check to help defray costs. The site received so many hits that the servers crashed Tuesday night and several times Wednesday, Szabo said. The city’s information technology department is working to rectify the problems. Anticipating about 250,000 people would converge on downtown streets for the service, the Police Department deployed 3,240 officers starting at midnight. When only about 1,000 fans showed up, police brass let about 1,000 officers go early. AEG Live, the owner-operator of Staples Center, has not committed any money to the Jackson memorial, which it organized and promoted. Company spokesman Michael Roth did not return messages on Wednesday. City Controller Wendy Greuel called on the City Council to create a policy declaring who should pay for city services associated with such events. In a letter to the emergency management department, Greuel criticized the nearly $49,000 expense for police officers’ lunches, which were ordered from a restaurant located 80 miles from Los Angeles. Greuel said her office called a local sandwich shop that could have provided box lunches for less than $17,500. The purchase would have had the added benefit of supporting a local business, she said. The Jackson memorial was the second recent event that resulted in extraordinary costs at a time when the city is a half-billion dollars in debt and facing employee layoffs. Last month’s victory parade for the NBA champion Los Angeles Lakers cost an estimated $2 million. AEG Live gave $1 million to the city for that event and other private donors stepped in.